Baobab Ingredient Market size was over USD 3.5 billion in 2017 and industry expects consumption of above 180 kilo tons by 2024. Increasing consumption of nutritious food owing to associated health benefits including improving digestion, boosting immune system, preventing anaemia, and asthma will drive baobab ingredient market size. Baobab ingredient is incorporated in nutraceutical products owing to its high amount of minerals & vitamins, antioxidants, anti-inflammatory, antimicrobial, and fibres which increases metabolism thus propelling the product demand. Baobab ingredient can be utilized in form of pulp, powder, and oil. These ingredients are derived from baobab tree cultivated in Africa, Madagascar due to its climate and soil conditions. It is rich in potassium, phosphorus, carbohydrates, and vitamin C. The berry from which powder and oil are produced is found inside rigid pods that hang upside down from tree. It has increased application scope in cosmetics & personal care and food & beverage industry. Global food and beverage market size is expected to surpass USD 138 billion in projected timeline. Consumers are demanding products, which have high nutritional content, have less preservatives, and are fat-free. Baobab ingredient is replacing high calorie beverages including soda drinks, alcoholic and carbonated drinks as a regular drink in China, Japan, Australia, India, U.S., and Italy due to changing consumer preference for healthy drinks. Baobab fruit is the essential raw material for manufacturing baobab ingredient, but labour and transportation play a vital role as well in the process. Africa has good government support as well as good soil fertility to help growth of the tree. Premium plucking process, production process attributes to high baobab ingredient market price. Adverse climatic conditions including global warming and droughts may hinder industry profitability, thus affecting price trends. Baobab powder ingredient market size expects over 4% gains in the projected timeframe. It is used in dietary supplements and act as detoxifiers owing to its highly adaptability in foods and rich nutritional content. The product is also used to make sauces, soups, smoothies and cookies. The powder also holds pharmaceutical benefits including lowering of glycemic index which in turn lowers blood sugar level in body which would drive product demand. 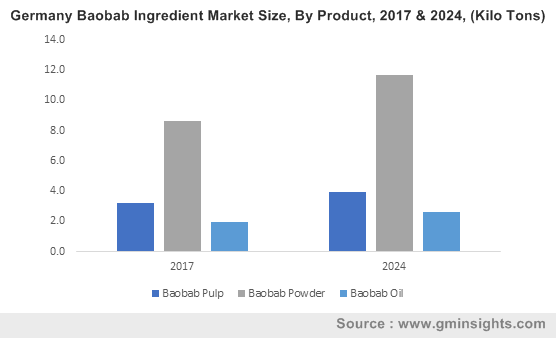 Baobab pulp ingredient market size anticipates 3.5% gains by 2024. Pulp is rich in magnesium, potassium, protein, fibre and vitamin C. The presence of fibre helps in maintaining good bacteria in gut owing to its prebiotic properties. It is also used as flavour enhancer, viscosity and texture modifier. Growing inclination of consumers for organic products, demand for baobab ingredient is predictable to boost during the forecast period, owing to presence of adaptogens which increase focus and stamina, thereby providing growth opportunity for key manufacturers. Baobab ingredient market size from organic powder form will surpass 25 kilo tons by 2024. Organic powder is mainly used for brewing beverages and in nutritional bars. It has a high demand from U.S. market owing to its utilization in beverage innovation and treating obesity. Shifting market trends for organic beverages would drive market growth. Baobab ingredient market size from conventional oil form expects over 3% gains by 2024. Conventional oil form is water soluble, which is used for anti-aging treatment products in cosmetic & personal care industry. Global personal care market was valued at USD 6.5 billion in 2017 and expects to grow at 5.5%. Rising preference for organic cosmetic ingredients will positively influence product consumption and boost baobab market size. Baobab ingredient market demand from food applications will exceed USD 1.5 billion by 2024 due to shifting consumer demand for organic food products. Global food market anticipates gains at over 6.5% by 2024. Growing health benefits from product is attracting manufactures to incorporate it in confectionery, baking, and flavouring applications. Baobab powder demand is anticipated to rise as it helps to reduce risks for chronic diseases. Baobab ingredient market size from nutraceutical application will witness 3.5% gains over the projected timeframe owing to it being a gluten-free ingredient. Global nutraceutical market expects to grow at 6.5%. The product is used in nutraceuticals owing to its vitamin supplementary qualities for aiding weight loss, boosting immunity and detoxifying skin from free radicals. Shifting preference for organic supplements with application in nuts, dairy products, confectionery items, sports drink would propel baobab product demand. 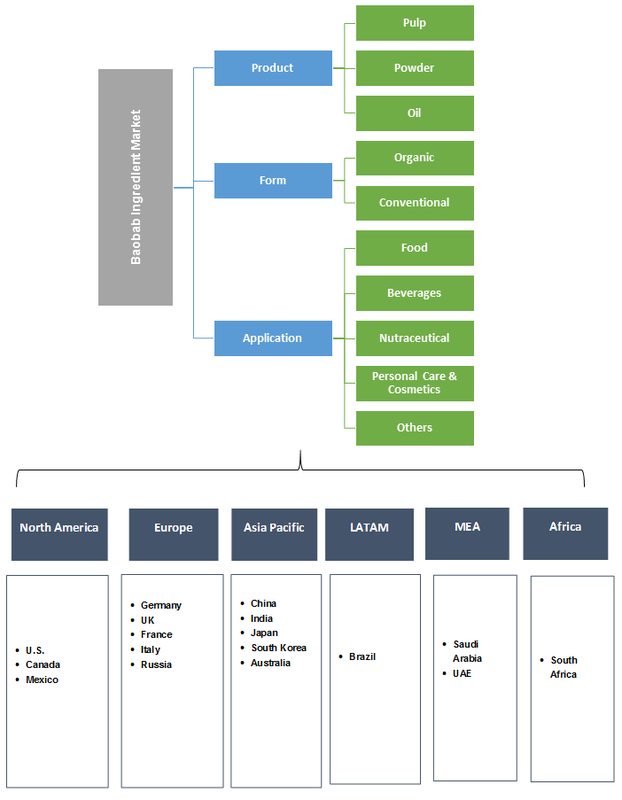 Asia Pacific led by China, India, and Japan baobab ingredient market demand is projected to surpass USD 995 million in the foreseeable timeframe owing to its growing application in nutraceutical and food industry for its taste and texture. The market is driven by steady innovation of high performance natural ingredients. Growing adoption of e-commerce and rising consumer awareness is likely to drive regional market growth. Europe led by Germany, France, and UK baobab ingredient market size may witness significant gains of 4% over the projected timeframe. Increasing consumer preference for organic personal care products including shampoos, day & night creams, body lotions, serums and toners owing to their production process that do not involve usage of harmful chemicals. The product deeply nourishes hair, protects skin from harmful UV rays and helps in skin tightening. Presence of premium cosmetic manufacturers including L'Oréal, Sephora and Chanel would have positive industry growth. North America driven by Mexico, Canada and U.S. baobab ingredient market may observe significant gains up to 4.5% owing to presence of essential minerals and gives beverages a distinct taste. Increasing beverage innovations using the product owing to buyer inclination for organic food products and heathy lifestyles would fuel regional product demand. Global baobab ingredient market share is highly competitive and moderately fragmented with key industry participants including Baobab Fruit Company, Atacora, Organic Africa, and Aduna Limited. Companies are investing heavily in research activities to innovate new products, retain their existing consumer base and capture higher market share. Companies are expanding their regional presence in Africa and Madagascar to make procurement easy for raw material. Manufacturers are launching campaigns to get shopper engagement in their product by organizing seminars for its health benefits. Baobab is cultivated in Africa, Australia and Middle East. The tree can store large amount of water within itself and withstand harsh climatic conditions. The product is a powerhouse of nutrition as it contains antioxidants, vitamin C, iron, protein, magnesium, potassium, and other essential vitamins and minerals needed by human body. It is expensive owing to its production and procurement process. Strict government regulation and large-scale production process attributes in making baobab ingredient a premium organic product.